The Condor Rip-Away EMT Pouch is designed to carry all your first aid gear and anything else you might need quick access to on the field. The pouch is designed to allow a user to quickly and easily remove the modular platform when needed. The strap and high grade velcro on the platform keeps it from falling off accidentally. The Rip-Away design gives the ability to utilize the bag in place or "rip" it away for easier access or even to transfer items to another operator. 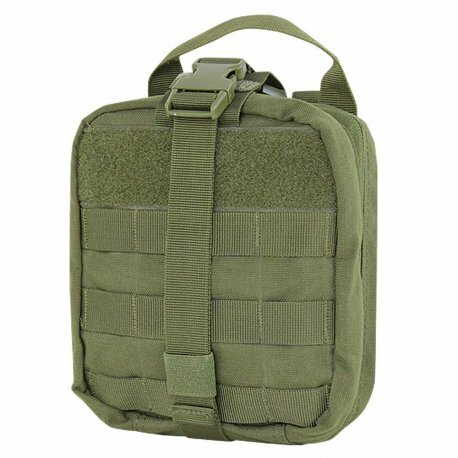 Help take you and your squad mates game to a whole new level with the Condor Rip-Away EMT Pouch! Addition 2" webbing, with pull-tab for quick/temporary closing. This is a great Medic pouch! I love it a lot more than the Condor First responder pouch. If you are a standard first aider or medical personnel you should get this! It has a lot of space and is light and durable! It was getting dragged around in the snow at a Winter event and it stayed dry!